A final ‘Golden Jubilee’ of the season took place over at Leyland Masonic Hall, Wellington Park and one which was proficiently overseen by Farington Lodge No 7277. The celebrant on this occasion was Eric Fred Nixon and there were a good number of brethren in the lodge room to see the ceremony which was led by Assistant Provincial Grand Master Stewart Seddon. Pictured from left to right, are: Stewart Seddon, Eric Nixon and Chris Blackwell. Following the competent opening of the lodge by Eric Nixon (WM) and the transaction of the lodge business, Stewart was admitted into the lodge room ready for the evening’s pleasurable event. He was accompanied by Chris Blackwell the Leyland and District Group Chairman and other grand and Provincial grand officers of the Province of West Lancashire. Eric offered Stewart the gavel of the lodge and for the purposes of celebration he kept hold of it. Stewart announced that the next business was to celebrate 50 years in Freemasonry by Eric Fred Nixon Past Provincial Junior Grand Warden of the Province of West Lancashire. He exclaimed that everyone had been summoned to a very special meeting to honour and pay tribute to one who has served the Craft both loyally and faithfully for 50 years and asked if Eric Nixon, the celebrant, could be seated in front of his pedestal. Stewart had recently visited Eric’s home where he was offered a cup of tea which was duly served, and whilst he had a captive audience in the lodge room, Stewart openly thanked Eric for the brew. He then exclaimed that he was pleasantly surprised that he had only been offered a standard mug as opposed to the Peter Rabbit one which Eric had been holding!! This as you can imagine brought a round of laughter from the members and a very red face from Eric. When everyone had calmed down, Stewart took everyone present back to 1945: King George VI was on the throne, Winston Churchill was Prime Minister of a coalition government and the war was rapidly coming to its conclusion. February saw Bomber Command blitz Dresden and in March were witnessed the last V1 and V2 rocket attacks on the UK. On 30 April, Hitler committed suicide in his bunker. On 8 May, VE day was celebrated throughout the UK and Churchill appeared on the balcony of Buckingham Palace with the King and Queen and the day after the German forces occupying the Channel Islands surrendered. In June the demobilisation of the wartime armed forces began. In July the BBC Light Programme was launched and in August the first ‘Giles’ cartoon first appeared in the Sunday Express. September saw the end of press censorship and October heralded the Piccadilly tube station becoming the first to be lit by fluorescent lighting. But on this occasion the major breaking news story of the year came from Mount Street Hospital on 7 June, Mrs Phyllis Nixon (nee Barker) gave birth to a son, to be named Eric Fred. Eric has a number of contemporaries, including, from the world of television; Jennifer Moss and Julie Goodyear from Coronation Street, newsreader Martin Lewis and football commentator John Motson. Pop stars include Rod Stewart, Elkie Brooks, Bob Marley and Eric Clapton. From the sporting world; Barry John, Brian Barnes, Virginia Wade, Derek Underwood, Pat Jennings and Tommy Smith. From stage and cinema; Martin Shaw; Charlotte Rampling; Tom Selleck; Ilyena Lydia Vasilievna Mironof or Helen Mirren as she is better known and Roy ‘Chubby’ Brown. Historian; Simon Scharma. Eric’s Father, Ronald was a dental technician who later went on to be export manager at BTR. His Mother was a weaver at Brook Mill and the family home was at 160 Stanifield Lane, Leyland, where he lived with mum, dad and twin brother and sister, Frank and Susan. As a boy, Eric attended the Farington Infant and Junior Schools from the age of five to 11 and then it was on to Leyland Secondary Modern (now Wellfield Academy) until age 15. At school he enjoyed athletics especially sprint and hurdles and when he was 11 he joined the Boys Brigade at Leyland Methodist Church on Canberra Road where he eventually became an officer, retiring in 2005. Eric was also very keen on judo from ages 13 to 30 only to be invalided out of the sport due to multiple shoulder dislocations. Upon leaving school, Eric got an apprenticeship with the North West Gas Board qualifying as a gas fitter, eventually ending up at the Leyland Undertaking, on gas utilisation for domestic, commercial and industrial properties. Also, on that apprenticeship course was his friend Michael Norris and together they were mad keen on motorbikes. One of their regular Saturday morning meets was at the Riverside Cafe (now known as the Tickled Trout) where upwards of 200 bikers would gather. In 1967 Eric found himself at the North West Gas Industrial Development Centre in Manchester working on the conversion from town gas to natural gas. Leaving the Gas Board in 1971 to take up a position in the Research and Development Department at Baxi in Bamber Bridge and where he stayed for some 13 years. He then bought a chemical distribution business selling chemicals to the motor trade and other industries. In 1997 Eric set up business as a gas, plumbing and heating engineer and technically retired in 2013. Whilst he was at Manchester in 1967 Eric’s attention was particularly drawn toward a young lady called Zoe Purcell. They started courting and with the romance blossoming they were married at Leyland Methodist Church on 15 November 1969. Their honeymoon was at the Regents Palace Hotel, Trafalgar Square. Eric and Zoe are blessed with two children, son Brian and daughter Janet, son-in-law Michael was present at the meeting. They have three grandchildren Olivia who is 17, William 15 and George 12. Moving on to Eric’s Masonic career, Stewart asked the lodge secretary to read the minutes from the meeting at which Eric was initiated. Eric’s father was a member of Old Worden Lodge No 5366 and eventually directed Eric towards Charlie Lockwood who became his seconder. Some three years following this conversation, Eric was proposed into Old Worden Lodge by his father Ronald and initiated on 2 May 1968. Eric became WM on 5 November 1981. He served as secretary of Old Worden Lodge from 1998 to 2007 and was junior warden on what was the saddest day in that lodges history when on 2 November, the lodge handed in its warrant – Eric speaking the last words. Eric then joined Farington Lodge on 8 October 2013 being installed as the WM in March 2018 and being honoured by the Province in 1994 when he was appointed Past Provincial Assistant Grand Superintendent of Works. He attained promotion to Past Provincial Grand Superintendent of Works in 2000 and was subsequently promoted to the very high rank of Past Provincial Junior Grand Warden in 2006. Eric was exalted into Carnarvon Chapter No 2376 on 10 March 1971 becoming first principal in January 1986. He was a founder of the Old Worden Chapter No 5366 serving as secretary from 1984 to 1998 and has been director of ceremonies since 2015. He received his first Provincial honours in 1990 when being appointed Past Provincial Grand Sojourner and in 2006 he was promoted to Past Provincial Grand Scribe Nehemiah. Eric is a keen clay pigeon shooter and is a member of the West Lancashire Clay Pigeon Shooting Society. At this point in proceedings Stewart asked that Chris Blackwell, the Leyland Group Chairman, read out the certificate of acknowledgement of the Province of West Lancashire’s great appreciation of his half a century of membership of the Craft. 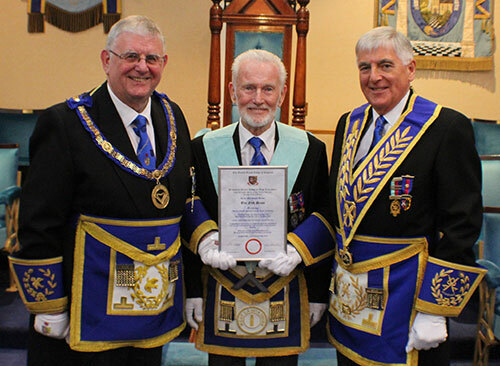 Chris duly obliged before Stewart then presented the certificate to Eric thanking him on behalf of the Provincial Grand Master Tony Harrison and of course the Province of West Lancashire. Eric retired from the lodge room with the Provincial team with everyone heading for the dining room for some camaraderie and more memories. Eric centre surrounded by grand and acting Provincial grand officers.